Ever since Nestle’s brand, Nescafe, revolutionized the coffee world in 1938 with instant coffee, they have been synonymous with quality. The brand has provided millions of cups of coffee. But as time progresses, many in the modern home want more international flavors like espressos, lattes, or cappuccinos. The Nespresso was actually designed in the 70s, but it didn’t become patented for more than 20 years. This device is an espresso brewer that creates 1.35-ounce shots of espresso. These espresso shots are ready quickly; in fact, preheating the water only takes about 15 to 30 seconds. The company produces 17 unique options that range from caffeinated and decaffeinated to more regional flavors. Over the years, Nespresso has developed quite a large amount of machines with various price points and abilities. Of these, you’re sure to find the espresso machine that will provide you with the aromatic drink that you love. In this guide, we’re going to review 6 of the best Nespresso Machines in 2019 that are currently offered on the market. 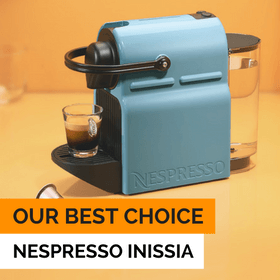 1 What is the Best Nespresso Machine to buy in 2019? 3.1 How does a Coffee Capsule Machine Work? 3.2 What Kind of Coffee Does Nespresso Make? 3.3 What’s Inside a Nespresso Capsule? 3.4 Are Nespresso Pods Safe? 3.5 Are Nespresso Pods Recyclable? 3.6 Do Nespresso capsules have an expiration date? 3.7 How Many Times Can I Use a Nespresso Capsule? 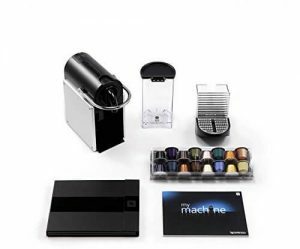 3.8 When I purchase a Nespresso capsule package, how many capsules will I get? 3.9 Are there hot chocolate Nespresso capsules? 3.10 What makes Nespresso unique? 3.11 How many different types of Nespresso Capsules are there? 3.12 What are some tips and tricks for Nespresso owners? 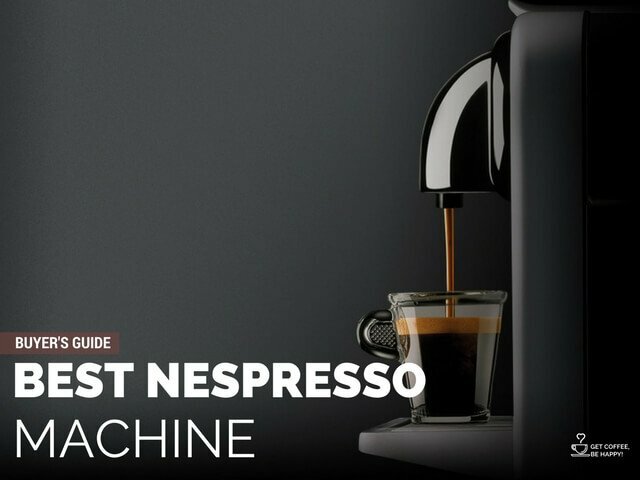 5.1 Did you like my Best Nespresso Machine Guide? What is the Best Nespresso Machine to buy in 2019? Our first device is the Nespresso Pixie. 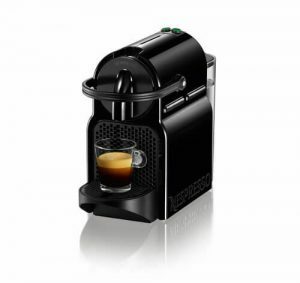 This machine is a great starter Nespresso unit that is amazingly compact and perfect for just about any kitchen. Its measurements are about 9.75 inches tall, 4.75 inches wide, and about 12.75 inches deep. To put into perspective, that’s only about 10 capsules tall; allowing it to fit just about anywhere. When it comes to design options, we found that this device fits in just about anywhere aesthetically. Nespresso’s Pixie line has a plethora of unique colors that fit any kitchen décor. This unit specifically has a titanium finish that blends well. This model is part of the D60 line of Pixie units, which means that it sports a vented pattern on the side. To operate the unit, you’ll have to lift the metallic lever/handle. Once lifted, the capsule chamber is revealed, and you can drop the Nespresso capsule into the machine. Once you select whether you want a standard espresso or a lungo (double shot), the water will start to heat. This device heats really fast; it only takes about 30 seconds for the machine to be ready to brew. Once heated, simply place your cup on the tray. The tray can accommodate cups up to 3.5 inches in height. If you need a space for a larger cup, simply fold the tray upwards and you can place your cup on the counter. This will free up another two inches of space. 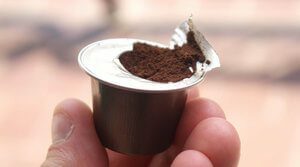 Once your cup is poured, the device will drop the empty capsule into the rear container. This container holds about ten spent capsules at a time. There is a LED light indicator to tell you when the device is ready to brew. This light is bright enough to illuminate a dark kitchen so that you can see the machine. The fold-up tray makes brewing lungo capsules easier. The tray doesn’t stay put by itself. You have to hold it up with a cup or your hand. The 24-ounce reservoir is somewhat small for coffee. On first glance, there aren’t a whole lot of aesthetic differences between the Inissia and Pixie line of Nespresso machines. An even more newbie-friendly device, the Inissia actually is newer than the Pixie line and is a more budget-friendly option. The devices have very similar sizing, the Inissia is nine inches tall, 4.75 inches wide, and about 12.6 inches deep. The Inissia is slightly svelter in the top section, and sports more rounded curvature than the Pixie. Whereas the specific model of Pixie that we’ve reviewed has a metallic design, the Inissia doesn’t have many metallic options. Instead, this line of espresso maker has eight unique color choices that range from pacific blue to red. These color choices make it perfect for adding a splash of color to your kitchen or matching a pre-existing décor. Similarly to the Pixie, this unit is operated by a front facing lever. Lift this lever up to engage the capsule compartment and load in your flavor. Unlike the Pixie, the Inissia doesn’t have a dedicated power button. In order to start it up, you’ll have to press either the espresso or lungo buttons. Amazingly, the Inissia actually takes a little less time to preheat the 24 ounces of water that it stores. It only takes about 25 seconds. Once heated, place your cup on the platform; if there isn’t enough clearance, flip it up and use the counter. Once brewed, the spent capsule is dropped into a container. To clear the container of its ten capsule capacity, simply pull it out by the tray. The small size is perfect for smaller kitchen space. This device is very budget-friendly. It’s the perfect device if you’re looking for an inroad into the world of quality espresso. This model doesn’t have a bright LED. The lack of a power button is unfortunate. Once again, this only has a 24 ounce capacity. Our next unit, the Nespresso Citiz, is a more full-sized experience as compared to the Pixie and Inissia. That being said, we found that this device has a perfect size and shape for many countertops. It also has a really nice black and metal design that makes it look very sleek, especially in modern kitchens. If you’re looking for a Nespresso machine that is great for a moderate user, this is for you. When it comes to overall size, this device is 14 inches tall, five inches wide, and about ten inches deep. If you’re a coffee enthusiast, you’ll absolutely love this device’s tank: it can hold up to 1.1 quarts of water. Gone is the loading lever from the Pixie and Inissia, you lift a tab to load capsules into the Citiz. After the capsule is loaded, similarly to the Inissia, power-on via the espresso or lungo buttons on the top. It takes about 25 seconds for the preheating process for this Nespresso unit, which is great for the larger tank. Once heated, either place a cup under the spigot for a 1.35-ounce serving or fold the platform for a bigger cup. After the capsule is spent, you drop it into the reservoir, which can be removed by pulling out the platform. Impressively, the device also has a nine-minute auto-off feature that turns the device off after nine minutes of inactivity. This helps reduce power usage and provides you a more eco-friendly brewing experience. The Nespresso Citiz is perfect for espresso enthusiasts who need a larger water tank and don’t mind the extra counter space. 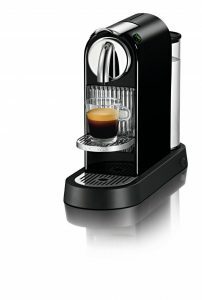 The Nespresso Vertuoline is a very premium option for those who love to brew espressos and cappuccinos in particular. As a matter of fact, The Black Peppercorn said that this device is like having a personal barista. In addition to the built-in espresso capabilities that are a hallmark of the brand, this one also includes a frother. 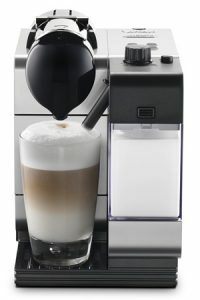 Frothers are used to make cappuccinos and macchiatos and simply froth the milk for your aromatic coffee. As a more premium selection, the VertuoLine espresso maker has a larger size than the units we’ve featured so far. In addition to this, it only takes VertuoLine capsules, which are rounder than the Nespresso capsules the other models use. Size-wise, this device is 11.9 inches tall, 8.3 inches wide, and about 11.9 inches deep. This makes it much bigger than our previous models, especially when it comes to width. Loading and unloading the VertuoLine capsules is also a slightly more complicated experience. You’ll have to turn the top knob and lift up on the handle in order to load the capsule. The coffee icon on the device will be blinking during the warming stage. When preheating, this device takes about 15 seconds to heat its 1.2-liter tank. This makes it the fastest heater in our review. If you need a fast espresso, this is the perfect device for you. Once the coffee icon stops pulsing, the machine is ready to brew. The default setting for this device is for larger cups, but for single shots of espresso, simply pull up the bottom platform. Once filled, you’ll have to open up the top panel again in order to drop the VertuoLine capsule into the storage container. This has a very large water capacity. The capsule container can hold up to 20 used capsules. The device will shut off after nine minutes of inactivity. This is a great way to reduce wasted energy. This device heats its water supply very quickly. The included milk frother is fairly high tech and adds options. Despite its quick heating, this device’s water could be a bit hotter. This countertop coffee system is a great looking piece of equipment that doesn’t take up too much room. It uses a water reservoir, a milk container, and special coffee capsules. I prefer to shop online, so I’m happy to buy the capsules that way. It’s not easy to find the capsules in-store which might be an inconvenience for some people. A few easy-to-use control buttons make it simple to make cappuccino, latte macchiato, espresso coffee, long coffee, or hot milk. You can even program it to remember the exact ratio of coffee to milk froth you prefer. Making your specialty coffee drink is pretty simple. Make sure your water reservoir is filled and, if making a latte or cappuccino, that your milk container is filled and attached. Next, you lift up a lever and insert your Nespresso coffee capsule. Press the button for the drink you want. Then, it’s time for my favorite part: watching the delicious drink be made before my eyes. It’s beautiful to watch. If you like your coffee drinks to be extra hot, run it once without a capsule to warm the machine up first. This will just dispense hot water into your cup. After your drink is made, your used capsule is automatically ejected into a special compartment. You’ll have to empty this every 10 drinks, but it’s really convenient to not have to do that every time. Espresso machines tend to be a challenge to clean, but it couldn’t be easier with the Nespresso Lattissima Plus system. After each coffee drink containing milk, you just press a button and it will self-clean. A few times a week, you just run the easy-to-remove component parts through the dishwasher. You will also need to descale the machine with a descaling agent, maybe a few times a year. A light will indicate when this is needed. Easy-to-use settings: You can make a variety of beverages using the 3 milk and 2 coffee settings. Programmable: You can personalize and customize how your drinks are made and easily save your settings. Energy-saving: It has an excellent energy consumption profile as well as an adjustable timer to turn the machine off automatically after use. Easy to clean: Auto-clean mode makes basic cleanings as easy as pushing a button and you can easily remove the dishwasher-safe components for a deeper clean. This is a perfect at-home coffee system if you’re looking for more than just a regular cup of drip coffee. This machine lets you make a cappuccino or latte by just pressing a few buttons. If you don’t want to spend a fortune on a fancy espresso machine, the Nespresso Lattissima Plus is a great option. The Nespresso Creatista Plus has a sleek stainless steel body. 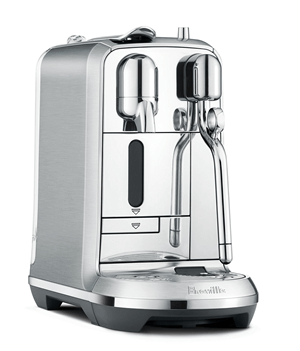 Nespresso has teamed up their brand with the work of Breville design. The machine is well crafted–the high quality you’d expect in Breville appliances. Simple and easy to use, the machine operates using first generation Nespresso style pods. These pods are widely available through third party manufacturers making them easy to find, as well the opportunity to find the brew that’s right for you. The settings allow for up to three types of espresso sizes: ristretto, espresso, and lungo. The screen is easy to read, and overall the features are super intuitive. The set-up allows for the user to easily create a wide range of common coffee delights. From Espresso, cappuccino, flat whites, latte, and macchiatos, the barista really does come into the home. Best of all the user is not highly involved in the process. The automatic milk frothing featuring allows you to set your preference and walk away. The steam wand also features a sensor to monitor cleaning. The heating system works quickly. It features adjustable temperature settings. The water reservoir is an impressive 1.5 liters–double that of the typical Nespresso machines out there. Though there isn’t an indicator of when the water is low, it is easy to access and remove. The bottom tray does well at handling overflow, and there is a floaty that pops up if it gets full. The machine will automatically power off 10 minutes after use to save energy–great for the eco-conscious. Hands free cleaning: The used pods drop into a reservoir for recycling and leave you with less to do. Less Mess: The pop-out shelf feature helps give espresso drinks a lift, allowing for less platter, and the stainless steel body is already easy to clean. Powerful: It features 19 bars of pressure giving that hissing and churning you’d expect to hear as the magic of a delicious coffee concoction is being formed. Smart: When you have an intelligent appliance, life is easy. The machine reminds you when the steam wand needs cleaning and provides instructions. Thoughtful things like this are why Breville is wonderful. 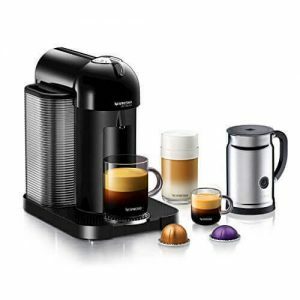 Options: The Nespresso Creatista Plus features a boat-load of adjustable preset combinations to satisfy any coffee snob. Choose the volume, amount of froth, temperature, and so much more. A great way to start your morning! The Creatista Plus is so simple and easy to use, as well as an attractive and well-designed appliance. The coffee is delicious: a quality you’d find served up by a barista. Plus the kids can enjoy some frothy hot chocolate too! The Nespresso Creatista Plus qualifies as worthy of your kitchen counter space. A luxury to own, it comes with a steep price tag, but don’t let that discourage you. If you find yourself spending cash on high priced coffee made by your nearest barista, save your money and time: the Creatista makes some serious coffee and it is a great investment. 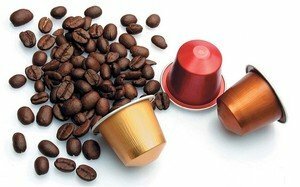 How does a Coffee Capsule Machine Work? The series of Nespresso coffee capsule machines provide espresso via capsules that hold Nespresso’s patented espresso formulation. Each machine has three settings: one for crafting a single serving of espresso, which provides a 1.35-ounce shot. The second setting creates a lungo, which is a 3.7-ounce drink that is similar to a standard coffee serving. The final option that Nespresso owners have for their coffee is a ristretto or a 0.85-ounce micro-shot of espresso. What Kind of Coffee Does Nespresso Make? You can prepare several types of espresso coffee with a Nespresso machine. There are many unique flavors originating from South America, Africa, and Asia. With the Nespresso, they can all be crafted into iconic drinks like Cappuccinos, Lattes, or Macchiatos. For frothy milk, you can purchase a frother from the company as well. 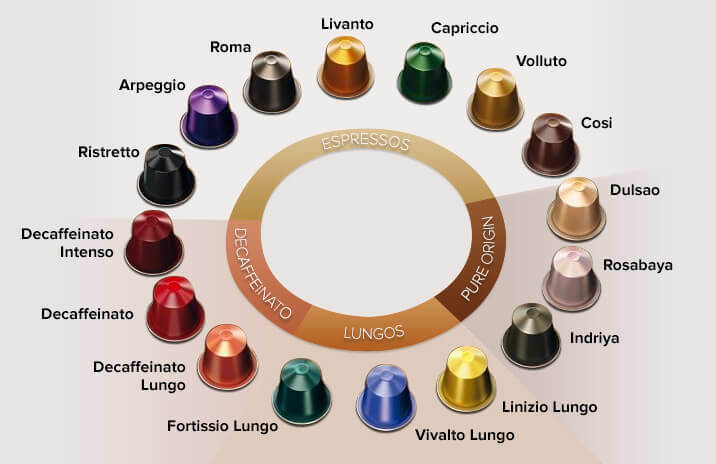 We go through the Nespresso varieties in the “How many different types of Nespresso Capsule are there” part of the FAQ. What’s Inside a Nespresso Capsule? Inside of a Nespresso capsule is powdered espresso. While this might seem simplistic, you simply cannot just add water to these contents and expect an espresso experience. To achieve the right flavor, the machine must be used. There’s a great experiment with the innards of a Nespresso capsule on SlideShare. Each Nespresso capsule is made of aluminum and a food grade shellac coating. While water passing over the aluminum can be a problem safety-wise, water actually only interacts with the shellac. This ensures a very safe cup of coffee. This being said it’s absolutely imperative that you keep your machine clean and use filtered water. We’ll cover more on that in the tips section of the FAQ. Nespresso capsules are perfectly recyclable; as a matter of fact, it is Nespresso’s stated goal to see that 75 percent of all Nespresso capsules are recycled. To reach this goal, they have established collection points. This is so that the capsules can be reused and Nespresso owners can reduce their carbon footprint. Do Nespresso capsules have an expiration date? There is no official expiry date on Nespresso capsules, but they do have a “best by” date. This date is merely an indication of when the capsules should be consumed for the best sense of freshness and flavor. Typically, this best by date is within the first six to nine months after purchase. Capsules used after this time will not necessarily taste any worse, so don’t fret. How Many Times Can I Use a Nespresso Capsule? As a rule, you should really only use Nespresso capsules one time. When I purchase a Nespresso capsule package, how many capsules will I get? Typically, Nespresso brand capsules come in a sleeve of ten capsules. Are there hot chocolate Nespresso capsules? If you are looking for first party Nespresso branded hot chocolate, then, unfortunately, the answer is no. On the other hand, there are a few companies who make Nespresso-compatible hot chocolates that are pretty delicious. If you want a Nespresso branded chocolate experience, while you won’t get hot chocolate per se, they do have this here. Unlike other brands of coffee makers like Keurig, Nespresso focuses primarily on espresso. Each of the unique machines can make non-traditional shot sizing via the lungo options and capsules. Nespresso is typically an option for those who love a quick shot of espresso during the day. How many different types of Nespresso Capsules are there? This is the standard espresso faire; Nescafe has a plethora of flavors for you to try out. These range from flavors like livanto, which provide the flavors of South American to Ristretto, which provides the unique taste of East African and South American arabicas. Nespresso has released a lot of capsule varieties over the years. The entire list of Nespresso espressos includes: Livanto, Capriccio, Volluto, Cosi, Livanto, Roma, Arpeggio, Ristretto. For those who want less “kick” to their coffee, Nespresso has several decaf options for their capsules that cover the flavors categories of its chief capsule types. Decaffeinato is more life standard espresso, lungo requires more water, and intenso uses the flavors of South American arabicas. Lungos provide more than just a shot of coffee. These provide a more traditional amount of coffee, usually requiring more water and a larger cup for the fullest of flavors. Here are the Nescafe options for caffeinated lungos: Fortissio Lungo, Vivalto Lungo, Linizio Lungo. The pure origin line is designed to provide the flavors of a specific locale. Dulsao is designed to emulate the flavors red and yellow bourbon coffees from Southern Brazil, Rosabaya is made to taste like coffees grown in the Colombian plantations, and Indriya is made to taste like Southern Indian coffees. What are some tips and tricks for Nespresso owners? Always prime your machine before use with hot water: This cleans the machine, warms your cup in preparation for the coffee, and it lets the machine reach the optimal temperature for your coffee much quicker than a cold machine. You can brew an Americano in your Nespresso: Simply brew up a standard espresso shot in your Nespresso machine and pour it into a large cup. Then, simply pour hot water into the cup until it is filled. This will taste more like a standard cup of coffee. Always use filtered water in your machine: Tap water has minerals in it, so before you use your Nespresso machine with tap that’s going to allow for mineral or limescale buildup on its inner workings, try to use filtered water; it’ll leave your machine’s workings cleaner of minerals. This will greatly extend your machine’s life as well. Always clean your machine after use: The brew basket where your Nespresso cups are stored should be cleaned immediately after use. This means that you should eject the cup and run water through the basket in order to remove any excess coffee grounds from the device. These coffee grounds, as well as the oils that can be left over after use, can contribute to brewing substandard cups of coffee, so you’ll want to clean this area after every use. While you are doing this, take the time to clean the tray as well. Don’t forget there are Nespresso-compatible cups from other brands: These are typically cheaper options and you’ll find that they also have different flavor choices as well. For a more exhaustive list, Aromacup.com has a great guide on Youtube. Owning a Nespresso machine is a great investment in the quality of your coffee experience. These machines are high tech, have a plethora of budget choices, and accommodate various levels of user experience. If you like coffee, especially espresso, there is literally no reason to not purchase one of these devices. We hope that this list of Best Nespresso Machines, as well as the accompanying FAQ, helps you. There are a plethora of flavors and choices offered by Nespresso, so be sure to try all of the flavors that come with your new machine. Also, some machines are more lungo friendly, like our last device that has a larger space for larger cups. When deciding on your new Nespresso, take whether you like Americano-style coffee a little more than espresso into consideration. In any situation, enjoy the machine you pick; it’ll last you for years and provide you with thousands of delicious coffee experiences. What is the Best Espresso Machine for Beginners in 2019? Did you like my Best Nespresso Machine Guide? If you found this guide helpful, please take a few secs to rate it! Find the Best Nespresso Machine Reviews of 2019 with our Buyer's Guide. Read our guide to compare taste, speed, ease of use, and ease of cleaning. NAVIGATE OUR TOP 6 NESPRESSO MACHINES!